It has been a pleasure for the Communication Team of GC36 to serve the worldwide Society of Jesus, its collaborators and friends, through a number of communication channels during the duration of this Congregation. Our work will remain available on the gc36.org website and through the Office of Communications and Public Relations of the General Curia. We wish that our efforts will support fruitful follow-ups of GC 36 everywhere. A.M.D.G. All our work would have been impossible without the collaboration of many people that we would love to recognize on this note. The GC36 Committee for Communications (our link with the Delegates). Tim Kesicki (Coordination Committee), John Dardis, Patxi Álvarez de los Mozos. For Fr. General’s interview : Eugenio Costa, Jesús Rodriguez. 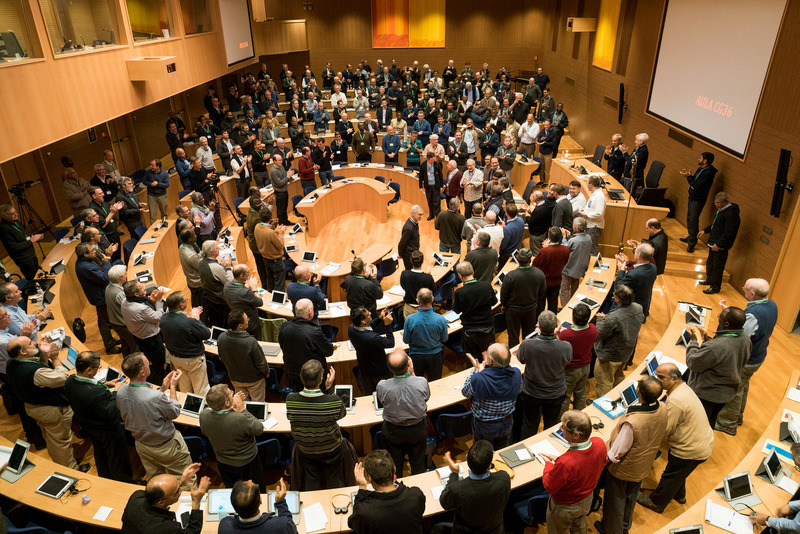 Special collaboration: Luis Delgado (from the San Saba Community), Fernando Luis Barreto, and all the influencers and comm officers from the Jesuit Conferences and Provinces who have helped us to difumine and amplify the information throughout the whole jesuit apostolic body. Hyacinthe Loua, Fulgence Ratsimbazafy, Gabriel Côté, Étienne Grieu, Thierry Dobbelstein,Victor Assouad, Jean-Baptiste Ganza, José Ignacio García Jimenez, Javier Vidal, David Fernández, Gustavo Calderón, Arturo Peraza, Ronald Mercier, Chukwuyenum Afiawari, Wendell D’Cruz, Brian McCoy, Dermott Preston, Antonio Spadaro, Jean-Paul Hernandez, Carlo Casalone. And special thanks to the Superior, Minister, staff members and Infirmary personnel of Residenza S. Pietro Canisio who hosted our team during these six weeks.